If you really want to demonstrate your love to the man in your life, one of the most effective ways is to gift him the right type of a man’s ring. There is a popular misconception that jewelry is meant only for women whereas some special jewelry particularly rings, if chosen with care, can make men look gorgeous as well. Men's rings need not be a gift only to your lover or husband as you can also present it to your father, brother, son or a male friend on special occasions. You will quite often find men appreciating you when you present them with a stunning ring befitting the occasion. To shop for a man's ring is quite often less tedious than shopping for women’s jewelry – provided you have a good idea concerning the design that will best suit the wearer. For instance, if he is a fantasy fan, you can always present him with a replica of the famous One Ring. If he is a techy, you can consider a highly polished man’s ring created out of brushed steel or silver. It will be ideal if you really search for a ring that is going to suit his tastes, his interests and the way he dresses. Remember that at Novori Jewelry we have a full line of men's rings both plain and fancy to match the taste of almost any man. 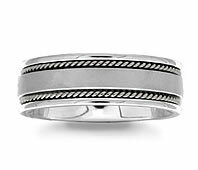 As a rule when selecting men's rings, it is a question of choosing between a thick or thin ring. An average width for a men's ring is 6 mm - 7 mm. If he has got thick fingers, it would be preferable you select a wider ring, maybe 8 mm or 9 mm. If he has got slim fingers, then a thin ring (like 6 mm width) will have better aesthetic effect. As a guide, try to make the ring match the man wearing the ring as much as possible. For choosing appropriate men’s rings, it will be helpful to know a bit of male psychology. Most men want to appear individualistic and constantly try to differentiate themselves from other men - be it hairstyles, the cars he drives, his favorite sports, movies and books. Biker Rings are a fascination with avid motorcyclists and they value them as much as their leather jacket. These somewhat oversized rings are available with ‘skull and crossbones’ designs that resemble bike chains. Some of these rings are awe-inspiring adorned with snakes, eagles and other wild creatures. For custom made rings, call Novori Jewelry toll free at 1-800-877-877. When selecting men's rings, there are some rings to be cautious purchasing. These include carbon fiber rings for men that carry a black or gold textural carbon fiber inlay with a tungsten, titanium or stainless steel band to lend an exotic look. The quality of the product just don't last very long. Also there are Spinner Rings and they come in numerous styles and designs. The popular ones include a five-band spinner ring where each of the slim stainless steel bands rotates independently. Men favor select spinner rings from amongst Celtic rings, Christian rings etc. These rings tend to break easily and stop working once dirt & grime get into the workings. Sweetheart Rings for men are widely bought by women who want their men to wear a ring that expresses love and passion. In fact, women are fond of buying these sweetheart rings for their lovers as an engagement gift. Some bestsellers include a band with the word ‘Forever’ or ‘Endless Love’ engraved on a black enamel surface plate. The price of men's rings largely depends on the metal used. Some of the inexpensive type of rings is of silver that come either in plain silver or with some colorful enamel work on them. Silver rings loose their shine and luster very quickly. Most men’s gold rings and men’s diamond rings are made of 14k or 18k gold which are symbols of aristocracy and affluence. As a precious metal, these rings are valued and easy to work with and create beautiful, lasting jewelry. 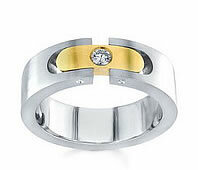 Today, most young people prefer to wear rings that are made out of either gold and platinum with a rough matte finish. Novori Jewelry has hundreds of rings styles available or can create your custom ring for you. Contact us at 1-877-877-4141 for assistance.